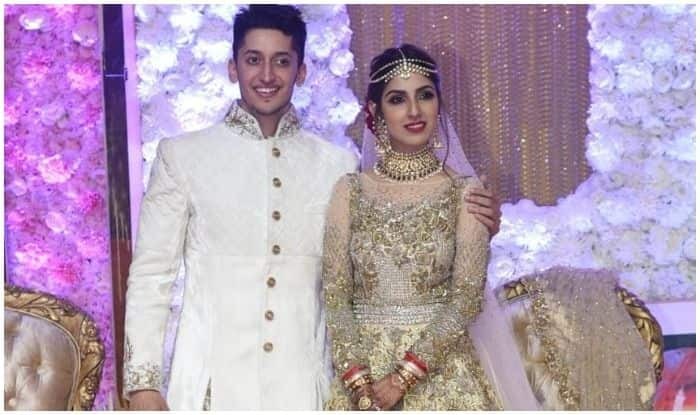 Azhar Morani, son of Cineyug Entertainment Private Limited’s founder, Mohammed Morani, recently tied the knot with Tanya Seth and threw a lavish reception on Saturday night which was attended by Bollywood hot-shots like Salman Khan, Rekha, Sonakshi Sinha, Juhi Chawla, Elli Avram, Urvashi Rautela and Aahana Kumra among others. Dressed in their best traditional attires, the celebrities turned the reception into a gala night as they wished the young couple on their happy day. While Rekha looked gorgeous as always in a graceful sharara, Sonakshi donned a stylish indo-western outfit in mauve colour. Salman Khan’s rumoured girlfriend, Iulia Vantur, who was also present at the celebrations, glittered in gold. Juhi Chawla looked resplendent while television actor-couple Gurmeet and Debina, smiled lovingly for the paps as others made their stylish entries to the venue.